All orders placed with a dockBoss+ will ship out on 9/28/2011, when those cables are set to begin shipping. We’re super excited to get these into your hands and to hear your thoughts, so please send any and all feedback, questions, or concerns to us at service@cablejive.com. For the past few months, we’ve been plotting our official foray into the Facebook world. A little over a month ago, our page went “live” with some basic company info, useful links, and an active wall for people to share their thoughts with us. It was pretty bare bones, but contained enough information to be functional until we could get it all polished and up to speed. Today, we feel confident in the strides it’s taken, and have officially “launched” our Facebook page. That means we’ll be hopping on there regularly to respond to our fans and customers, update info, post some pics, and run some fun promotions as well. And we’d love it if all of you came over and joined us! I’m no fool. I know there are at least a hundred reasons you’re on Facebook that don’t involve companies pitching stuff to you (you know, like untagging yourself from that picture you didn’t know was taken last night, reading about how miserable your friend’s trip to the DMV was, writing statuses about how awesome Mad Men is, etc.). But for those loyal few who stop by and “like” us in the next week or two, we’d like to show our appreciation for you spending any of your valuable time with us. The short of it: Like us on Facebook ASAP and get a special discount code good for 25% off your next CableJive order. And while our friendship can last an eternity, this offer will not, so act fast! 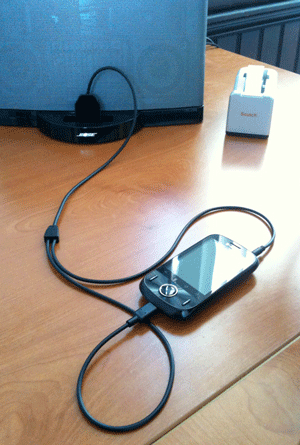 I’ve gotten a Zune connected to an iPod/iPhone dock in the past, but what seems more compelling these days with the rise of Android is to make an adapter or a cable to get a micro USB device to an iPhone, iPod, or iPad docking station. Important caveat: it’s technically impossible to provide the same kind of device integration that an iPod/iPhone car or speaker system provides; audio, video, track and playlist control, viewing track information on the car system, etc. Those are things that Apple’s 30-pin docking adapter all have built in, which is why it is so compelling and revolutionary. A micro USB connector can only really charge and sync a device, it doesn’t not have the connections to do all that fancy integration. I wish there wasn’t this caveat. However, if you’re willing to accept the compromise that Android integration cannot match what Apple provides, but want to at least get something out of that iPod/iPhone speaker or other docking system, there’s a way. CableJive’s dockBoss+ adapter cable does exactly this, it lets you plug a smart little adapter onto your iPod or iPhone speaker dock or car system, and provides a micro USB and audio cable so you can charge your Android phone and listen to audio, both through your docking system. It’s not the ultimate solution, but until Apple decides to open up their proprietary communication system (never going to happen), getting micro USB and audio to connect an Android phone to your iPhone, iPod, or iPad dock at least keeps your phone charged and keep the music playing.